Julian Hipkins III. Photo by Rick Reinhard. 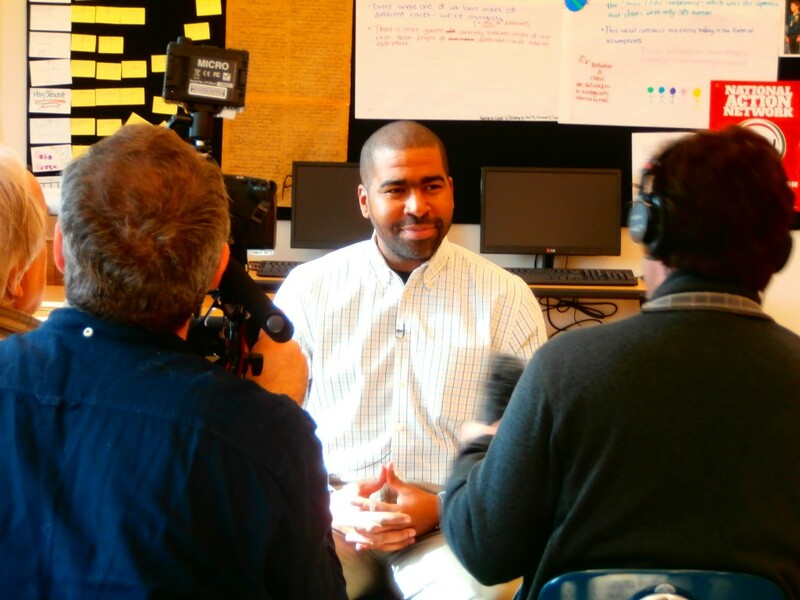 Award-winning high school teacher Julian Hipkins III has been a long time collaborator with Teaching for Change on countless initiatives from the Zinn Education Project to Storycorps to Civil Rights Teaching. We are very pleased to announce that the collaboration will now be full time as Hipkins joins our staff as the Civil Rights Movement and Labor History Initiative for Mississippi Project Director and overall Teaching for Change Curriculum Specialist. 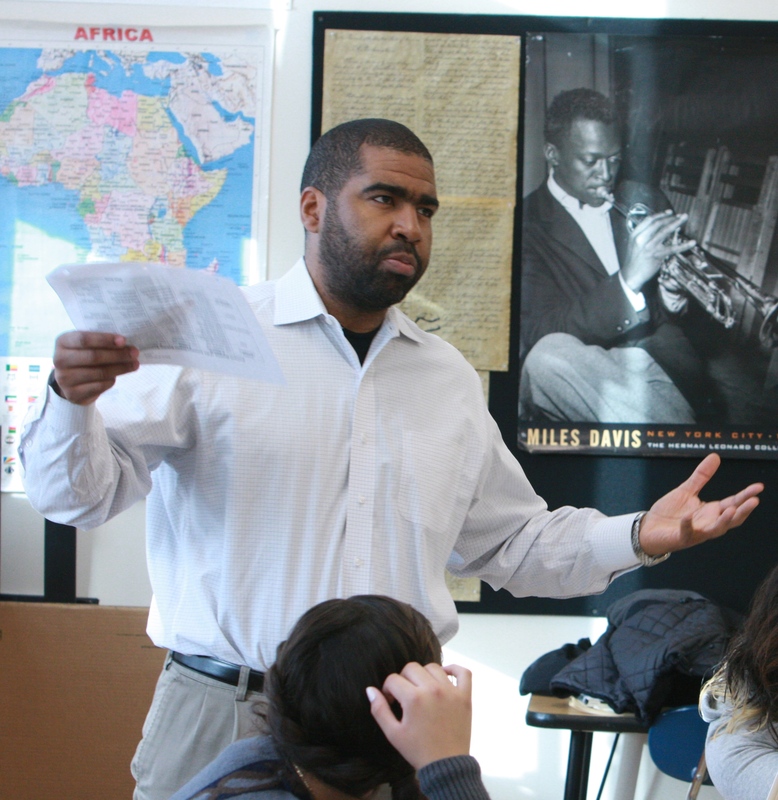 Hipkins has received numerous awards for his teaching including the Agnes Meyer Outstanding Teacher Award, the Jackie Robinson Project Educational Initiative Outstanding Teacher Award at GWU, and the Gilder Lehrman D.C. History Teacher of the Year. 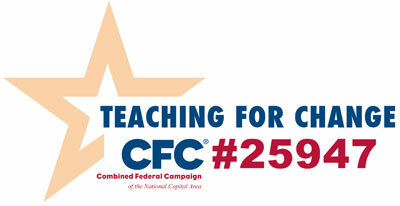 He is a member of the Board of Trustees of National History Day. 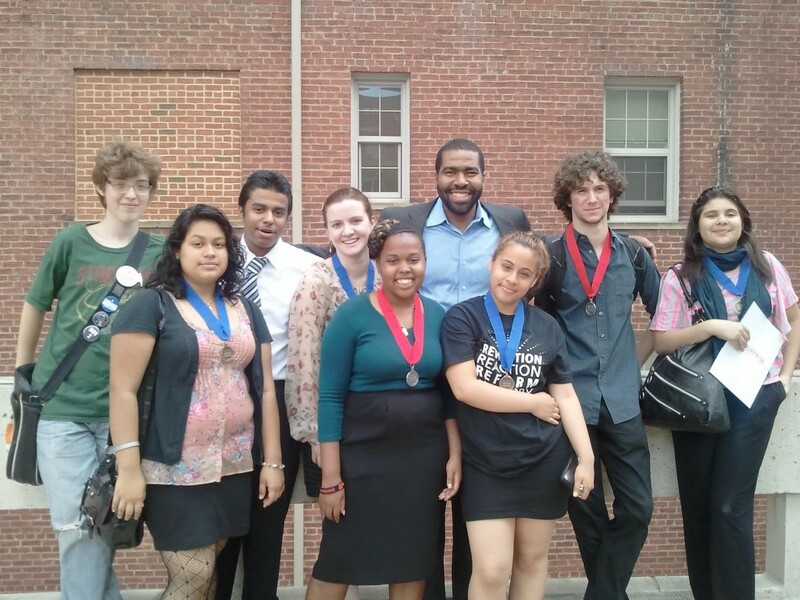 Julian Hipkins III and his students at the Washington, D.C. citywide National History Day competition in 2012. 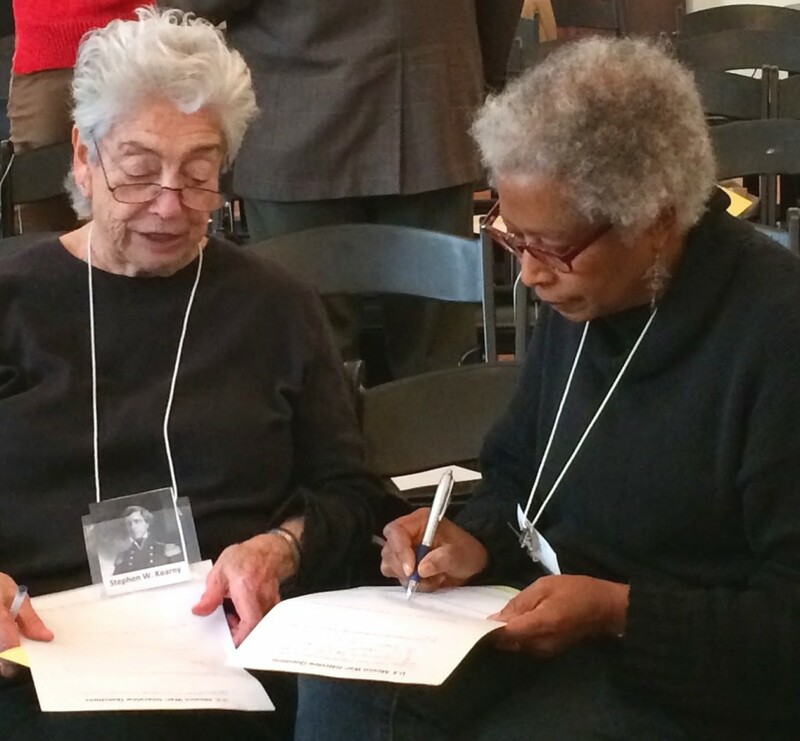 Alice Walker engaged in lesson facilitated by Julian Hipkins III at NYU. Hipkins brings 15 years of teaching experience to Teaching for Change, eight years teaching English in Japan and seven years teaching history at the Capital City Public Charter School where he served as a Critical Friends Group facilitator, coach of the Debate Team, National History Day coordinator, and a member of the high school Instructional Leadership Team (ILT). He earned his BA in History from Morehouse College and his MA in Teaching from American University. Spoke with two of his students at the dedication of the Zinn Room at the Hyattsville Busboys and Poets, along with many other special guests including Spelman president Beverly Daniel Tatum, Cornel West, and Marian Wright Edelman. 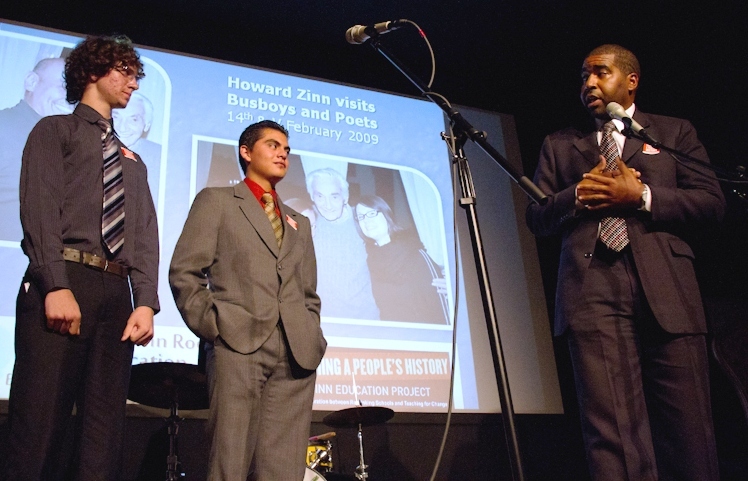 Julian Hipkins III (left) with students Jonah and Jared speak at the Zinn Room dedication. Photo by Jack Gordon. 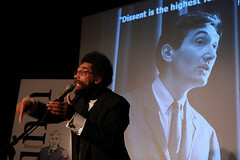 Hosted educator and community dialogues at the screening of ITVS films such as Daisy Bates: First Lady of Little Rock. Advised WGBH Education on the education pages for the documentary Freedom Summer. Risks and Rewards panelists Allyson Criner Brown, Julian Hipkins III, Genevieve DeBose, and Maureen Costello. 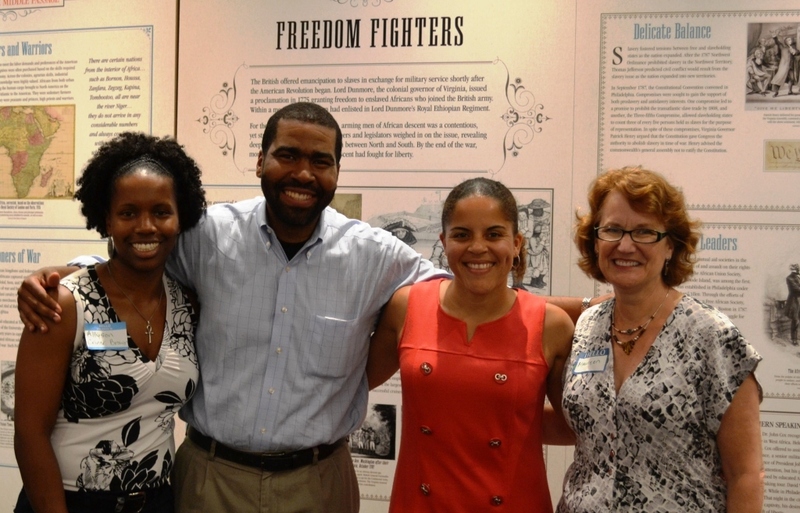 Served as a panelist on “Risks and Rewards of Teaching for Democracy: Activism in the Classroom,” in an event with Teaching Tolerance at the African American Civil War Museum. Julian Hipkins III interviewed by French film crew for documentary on Howard Zinn in November, 2013. 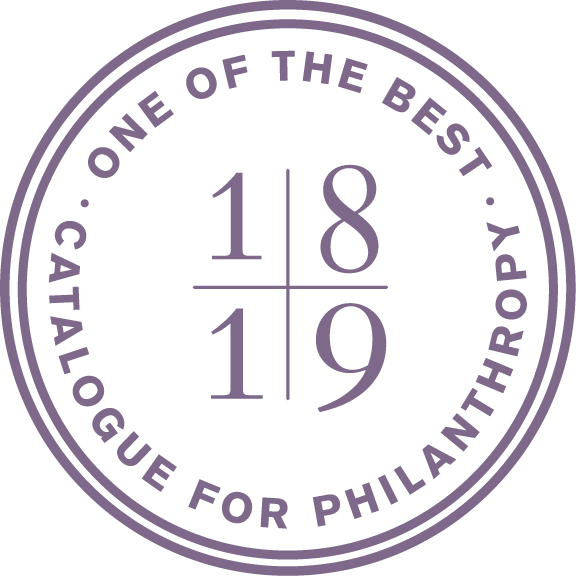 Featured in films and radio programs including a Radio France documentary on Howard Zinn and a Backstory program on teaching about Columbus. Facilitated professional development for other educators with the Children’s Defense Fund Youth Advocate Leadership Training (YALT) program. Olympics champion John Carlos with 11th grade students and Julian Hipkins III. Introduced Civil Rights veterans, authors, and filmmakers to students including John Carlos, C. T. Vivian, Joan Trampauer Mulholland, Annemarie Jacir (When I Saw You), Shukree Hassan Tilghman (More Than a Month), and Sasha Reuther (Brothers on the Line). McComb students at the Medgar Evers grave at Arlington National Cemetery. Led a tour for students from McComb, Mississippi of the unsung heroes at the Arlington National Cemetery. Conducted a StoryCorps interview with a student as part of the National Teachers Initiative in partnership with Teaching for Change and the Zinn Education Project. Facilitated a workshop for the Teaching Zinn panel as a part of the symposium “Howard Zinn: A Lifetime of Teaching, Writing, and Activism” at New York University. Hipkins has also participated in numerous professional seminars across the country including the National Expeditionary Learning Conference, the Civic Voices International Democracy Memory Bank Project, and the Little Rock Nine Expeditionary Learning conference. In June of 2012, he traveled to Normandy, France through National History Day with one of his students to learn about World War II and returned in 2014 as the lead teacher.